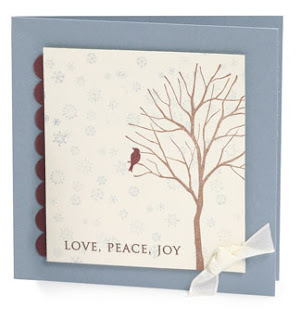 This card uses a new stamp set in the catalog called Branch Out. Isn't it pretty? So simple and serene. The Love, Peace, Joy comes from the chit chat rub-ons. How fun! Here is what was used on this card. I'm patiently waiting for my new catalog order to come. I'll have lots of new goodies to play with - can't wait!